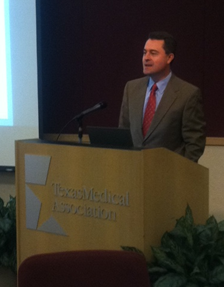 Commissioner Staples spoke to dozens of legislative staff and community and health care leaders at TPHC’s third University of Health forum focusing on obesity and its impact on Texas’ physical and fiscal health. Joining Commissioner Staples were Eduardo Sanchez, MD, Dallas family physician, TMA member, and vice president and chief medical officer for Blue Cross and Blue Shield of Texas; and Michael Castellon, e-communications coordinator and editor at the Comptroller of Public Accounts. Mr. Castellon revealed the disturbing truth: The Texas comptroller’s office found that in 2009 obesity cost Texas businesses an estimated $9.5 billion due to higher employee insurance costs, absenteeism, and other effects. Left unchecked, he said, obesity could cost employers $32.5 billion annually by 2030. To combat this trend, Commissioner Staples said the focus needs to be on lifestyle changes through education and improved nutrition standards. The Department of Agriculture developed the 3E's of Healthy Living in Texas to tackle obesity: Education, Exercise, and Eating Right. Obesity not only affects the individual's health but also affect the whole economy. So it is high time to combat this problem. And healthy lifestyle with right nutrition is very much useful. The lifestyles of people have seen great changes in past decades and it contributes a lot in increasing obesity. Wrong food habits, junk food etc are the major causes and need to be paid attention.